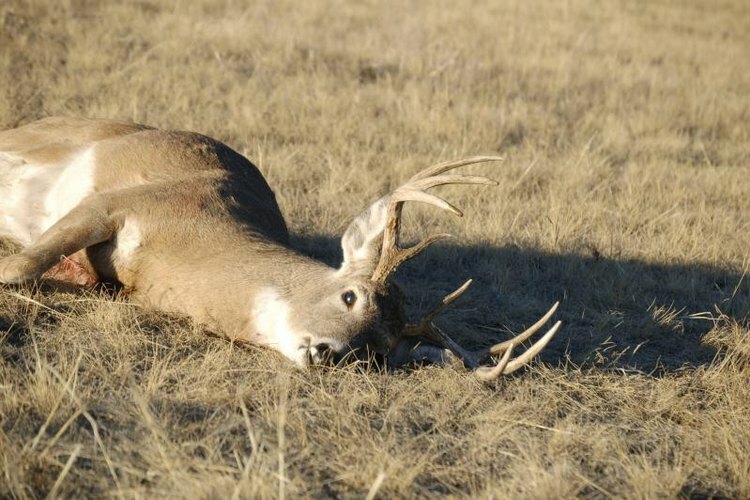 Once you bag your deer, you'll need an adequate location to skin it. A deer skinning rack is something you'll probably only use a couple of times a year but it will be well worth the effort to build. The rack will make it easy to string a deer up to a height at which you can comfortably skin the carcass. With some lumber and a few tools, you'll have a skinning rack up in no time. Measure and mark the locations for the two holes that you'll dig. The holes should be six feet apart. Dig with a shovel and post hole digger two holes 24 inches deep. This should be an adequate depth to keep the posts securely in the ground. Place one 10-foot post in a hole. Use a level to ensure that the post is set square and perfectly vertical. Back-fill the hole with a shovel. Tamp the dirt down every couple of shovel fulls to ensure that the post is snug and stable. Repeat Steps 3 and 4 for the second 10-foot post. Measure to find the center of the 6-foot post and drill a hole there. Then drill two holes in each end of the post. Place the bolt from the pulley through the center hole. Use a wrench to tighten the nut and secure it in place. Place the 6-foot post on the top of the 10-foot posts. Using the pre-drilled holes, secure the 6-foot post in place with wood screws and a drill. Run a rope through the pulley and attach a grambrel to the end of the rope. Tie the other end of the rope off on one of the upright posts. Call 811 prior to digging to determine if there are any underground cables where you plan to dig your holes. The 4-by-4 posts can be replaced by 2-by-4 boards. However the 4-by-4s make the skinning rack sturdier and will allow you to use it for such larger game as elk or for multiple deer.